The Boy and Me (I never tire of that little joke) have made crispie cakes a few times now, but we're yet to make proper cakes with icky stuff that could go all wrong and everything. That was until Sunday when I decided to take the bull by the horn and just do it. 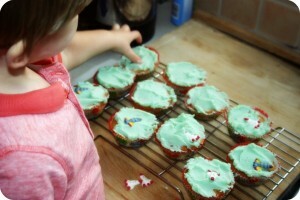 Spurred on by the 'I Love Cake' linky over on Mummy Mishaps, with Jenny having thrown the gauntlet down, I went for it. Therefore, I present you with our simple cupcake recipe. Please bear with us, one of us is a complete novice, and the other can't stand the sight of eggs. 1. 4oz of self-raising flour, butter, caster sugar, 2 eggs and half a bar of white chocolate roughly chopped. 2. Add the butter and sugar and mix together. 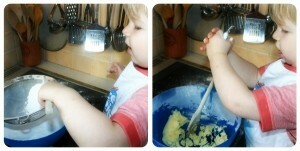 We used a balloon whisk. 3. Add the eggs and mix together. If it starts to curdle, add a small amount of flour. If you're two, try not to pour a third of the egg mix over the counter top as your mummy will feel sick having to clean it up. 4. Add the remainder of the flour and mix together. Then gently stir in the white chocolate. 5. Set out the cake cases into the baking tray. 6. 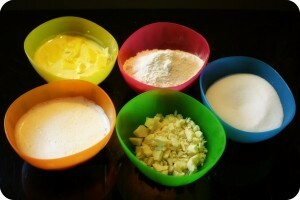 Spoon the mixture into the cake cases. Get your mummy to help with this because it's very twikky to do! 7. 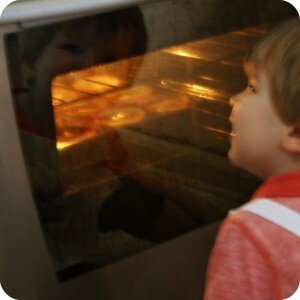 Sit and watch the cakes cooking in the very hot oven for 12 minutes at 180°C. 8. If you get bored, because 12 minutes is a long time, then make the buttercream. 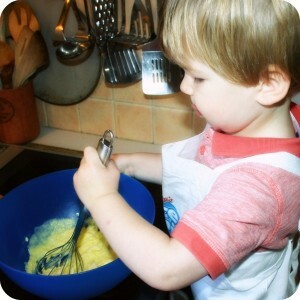 Sift 9oz of icing sugar into a bowl and all over the work surface. Add to this some softened butter, the other half a bar of white chocolate which your mummy had melted, and some blue food colouring because you're two and you can. Mix together really well. 9. 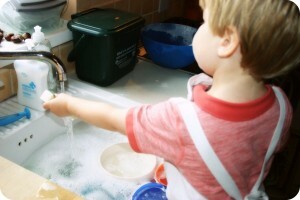 While the cakes are cooking, do the washing up. Every good cook does this, except that Gordon Ramsey fellow. 10. 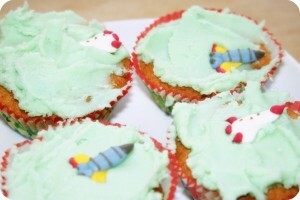 When the cakes are cool, spread the now green buttercream all over them and place rocket sugarcraft decorations on top. Try not to eat more than half of them because otherwise your mummy will have to open another packet! The finished product: White chocolate cupcakes! Not bad for our first attempt! I'm linking this up to Mummy Mishaps 'I Love Cake' linky. Click on the badge below to go and check out the other entries! ah Great work The Boy – I love the tongue sticking out! Looks like he really enjoyed it…it will have to be a weekly event now – maybe you could use that powdered egg stuff next time? smells very bad though….might make you feel just as sick!! A www bless the boy and you!! He did really well and they have turned out great! Not bad at all for a novice – my decorating is on a par with his and I am older than his mummy! !